Private Players | News and Features | Style Weekly - Richmond, VA local news, arts, and events. Scott Elmquist Mayor Levar Stoney is entering the 13th month of negotiations to redevelop a 10-block area of downtown that includes the Richmond Coliseum, which would be the city’s largest economic development project in 50 years. Who would run the massive, 30-year development project proposed for 10 blocks of downtown Richmond? What qualifications do they bring? What's their financial backing? How are they legally connected with each other? Who are their advisers? What are their roles? You'll find out when, and if, the $1.4 billion project moves forward, says Mayor Levar Stoney, whose administration enters its 13th month negotiating what would be the city's largest economic development project in more than 50 years. Until then, the answers remain under lock and key — or at least hidden behind Freedom of Information Act denials and other declined requests. The project was birthed by Tom Farrell, president and chief executive of Dominion Energy. He and six others formed the NH Foundation and the NH District Corp., filing with the State Corporation Commission on July 26, 2017. 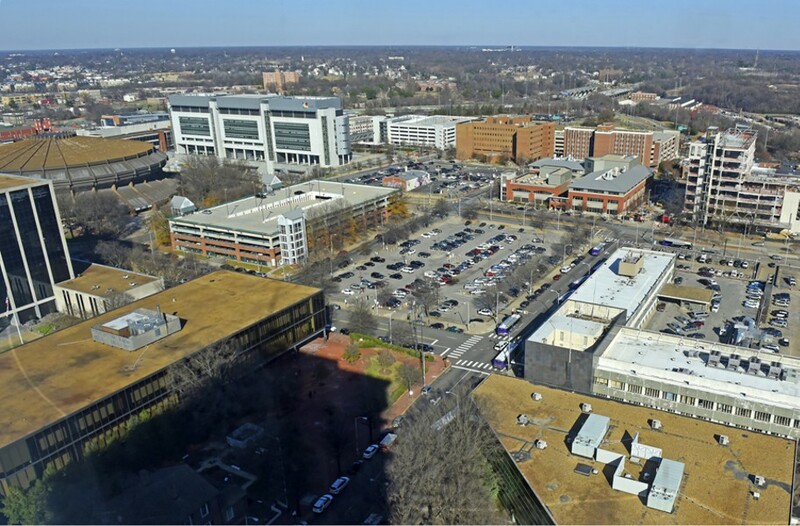 Four months later, Stoney called for proposals to redevelop the 10-block area from the closed Richmond Coliseum at Fifth Street, behind the Richmond Marriott, to 10th Street, behind City Hall. He stressed that the idea was a "city of Richmond project," belonging to "no other entity." The city received a single submission for the project, from the NH District. In November, the mayor held another news conference to announce an agreement in principle with NH District to build a 17,500-seat arena, hotel, apartments, restaurants, retail, affordable housing and a restoration of the historic Richmond Blues Armory. He named only two people connected with the project — Farrell, who was in attendance, and C.T. Hill, a former executive with SunTrust who retired in February 2012, after 41 years with the bank and its predecessors. Hill is the only person listed in documents with the SCC, named as president of the NH District Corp. and the NH Foundation. More than five months since that news conference, Stoney continues to face questions about the project while stumping for his proposed city budget under consideration by City Council. Stoney continues to say his team is working to get the best deal for Richmond — but declines to offer any other details until those negotiations are over. "It's really not clear what's going on here," says Jeff Cartwright, a retired prosecutor from New Jersey who moved to Richmond in 2016. Interested in the project and frustrated by the lack of details, Cartwright says, he filed a lawsuit against the city after it turned down his Freedom of Information Act request to get a copy of the NH District's application. A judge sided with the city in December. "I was hoping that it would resolve by now with the release of some form of the proposal," Cartwright says. In refusing his request, the city cited an exemption in state law that allows officials to withhold public information if their bargaining power would be hurt by the information becoming public. With that decision in mind, Style Weekly filed a FOIA request seeking only one portion of the application — section 4.3.4, in which the city asks for a list of people involved, including such information as key personnel, advisers and references. Style contended that such information would not interfere with the city's leverage in negotiations — and that for a project of this magnitude was in the public interest. The city denied the request March 29 with an email from Matthew A. Welch, senior policy adviser in the Planning and Economic Development Department. "Release of the Proposal (or portions thereof) during such negotiations would 'adversely affect the [City's] bargaining position or negotiating strategy,' and, therefore, the records responsive to your request are being withheld from disclosure," Welch wrote, citing Virginia code. Style appealed, and also turned to the NH District Corp. and NH Foundation, asking them to share the information. Taking the lead from Richmond officials, they also declined to share that section of their application. "Because the City and NH District remain in active negotiations," spokesman Jeff Kelley said in a written response, "we respect the City's decision to ensure this process is handled without compromise." The entities aren't entirely mysteries. There are contractors such as Kelley, and others working to drum up support. Style has met and interviewed real estate lawyers with the firm Roth Jackson, who speak on the project's behalf. A former adviser to Mayor Dwight Jones, Grant Neely, who works for Dominion Energy, has been a public face of the project, referring to his role as a volunteer who works for the board of the NH Foundation. But none of those people, at least on paper, is known to be a director, officer, board member or full-time employee. In their articles of incorporation with the SCC, NH District Corp. and NH Foundation filed as nonstock corporations, meaning no one will be granted shares, and neither entity operates for profit. Both entities also have applied to receive the nonprofit designation of 501c3 at the federal level. Kelley declined to offer a copy of the applications or the date of their filing, saying only, "The 501c3 application is still in process." A Virginia nonstock corporation doesn't need federal nonprofit status unless it wants to receive the associated benefits, says lawyer Kathleen A. Kelley of Arlington-based Bean Kinney & Korman. "There is no time line" on filing, says Kelley, who specializes in corporate and transactional law and government contracts and works with nonprofits. Because the NH organizations aren't yet 501c3s, other documents typically rich with public information, form 990s, don't exist — and wouldn't until the year after an organization becomes a 501c3. If the organizations still are waiting on their designations, Kelley says, the earliest a 990 would become available is 2020. That's been a frustrating realization for Josh Stanfield, executive director of Activate Virginia. Stanfield says he repeatedly sought access to 990 forms as a way of learning more about the NH District and NH Foundation. Why did NH District and the NH Foundation organize this way and seek a 501c3 status? They wouldn't elaborate. It isn't a city requirement for this project. But the designation comes with tax relief, the ability to raise money, leverage in getting grants and other benefits, lawyer Kelley says. At the SCC, the NH Foundation appears to be set up as the umbrella entity for the downtown project. The foundation is the lone member of the NH District Corp. and is run by a board. • Melody Barnes, co-founder of policy strategy firm MBSquared Solutions LLC. • Martin J. Barrington, the former chairman and chief executive of Altria who has been nominated as chairman of Anheuser-Busch InBev. • William H. Goodwin Jr., a philanthropist whose holdings include the Jefferson Hotel. He's the retired chairman and president of Riverside Group. • Dr. Monroe E. Harris Jr., an oral and maxillofacial surgeon and president of the board of trustees at the Virginia Museum of Fine Arts. • Dr. Pamela J. Royal, a dermatologist who serves on several community boards and is a director of Dominion Energy. In this kind of setup, Kathleen Kelley says, the board of the foundation makes long-term decisions. Its president and officers fulfill those long-term goals. The NH District likely serves as a separate entity to create a shield between it and the foundation board to reduce risk and liability, she says. Other reasons could be for management, taxes, record keeping or issuing bonds. Like the project itself, those details are unavailable. Cartwright, the retired lawyer who lost his case against the city, says his appeal is scheduled for a court hearing this summer. Until then, he doesn't know much about the $1.4 billion proposal, he says: "None of us do."